Sunday's trip to the Crossroads Village & Huckleberry Railroad included a stop at the Atlas Mill. 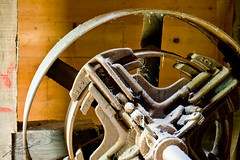 In the basement of the mill are several shafts, wheels, and pulleys, but nowhere will you find a water wheel. The stones of this mill are powered from a water turbine with all other systems within the mill being driven by electricity. To shoot in the dark basement, we cranked up the ISO on the DSLRs, opened up the lenses, and found something to brace the camera against. This was really the only wheel I found though which I thought interesting. I'm thinking that it is some type of clutch, but I'm not sure. If looks very cool and unused though.